In 2013 Compostmodern transitioned to a new venue and expanded its scope to two days. Produced by Sarah Brooks, the event was characterized as a conference for practical idealists; its all-star international speaker lineup was moderated by Nathan Shedroff and Eve Blossom. On the second day, John Bielenberg conducted a design blitz with conference attendees at the Autodesk Gallery. Over the course of two quick-moving, inspirational days, some of the best thinkers in the world convened at the Palace of Fine Arts in San Francisco to explore the cutting-edge of work surrounding resilient design in the public, private and nonprofit sectors. An incredible roster of artists, visual designers, brand strategists, interaction designers, product designers, architects, futurists, sustainability consultants, intrapreneurs and entrepreneurs from across the world shared ideas and explored solutions. Ezio Manzini, the Italian design strategist and expert in sustainable design, offered the opening keynote. Closing remarks were supplied by John Thackara, the provocative writer and thinker and founder of The Doors of Perception. Eve Blossom, founder of Lulan, and experience design pioneer and design educator Nathan Shedroff served as emcees. Additional speakers included Cheryl Heller, David McConville, Tiffany Shlain, Howard Brown, Jeff Barnum, Julie Sammons, Paul Polak, Wendy MacNaughton and Terry Irwin. 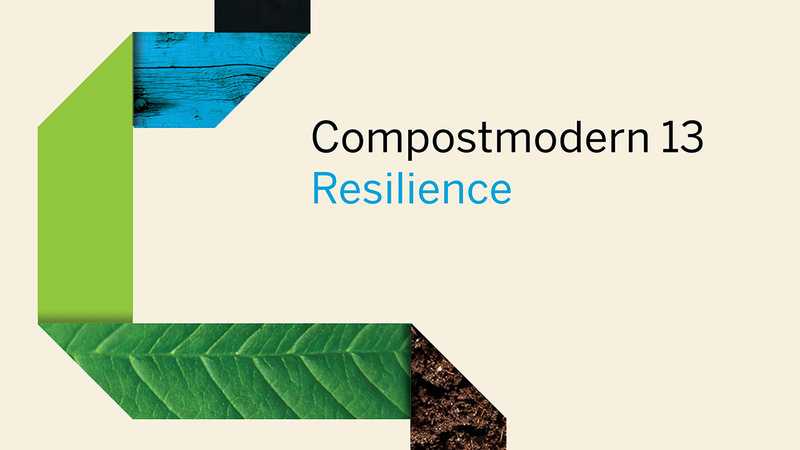 The theme for Compostmodern 2013 was Resilience. Resilient systems embrace change, rather than resisting it — they morph, bounce back, and continue to develop. They’re flexible, redundant by design and locally tuned, offering the potential to work in harmony with both our environment and our societies. Increasingly, designers are beginning to look at resilient systems as tools that can help us re-envision how to make the world work better for everyone. And some early examples of resilient design are already showing its massive potential to create changes that better the lives of people and the planet. The world is changing — fast. And the systems we rely on — ecological, political, social, educational, financial — are struggling to keep pace, crumbling under the increasing weight of these very challenging times. Accordingly, we must ask ourselves a very important question: If our present systems are struggling to adapt to change, how can we create more resilient systems that bend, but don’t break? Tiffany Shlain What Does It Mean To Be Connected in the 21st Century? Adam Werbach Can Sharing Be The New Shopping? Compostmodern 2013 creative development by Perin Rhambia, Henrik Olsen and Maria Guidice of Hot Studio.